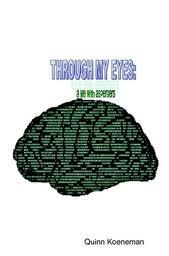 Through My Eyes: a life with Asperger’s by Quinn Koeneman. A 12-year-old’s introspective monologue on his life with Asperger’s Syndrome. “Through My Eyes” will enlighten readers to the challenges faced by Aspie kids, and on an individual level, the writer’s perspective on his world. Pp. 60. This entry was posted in Adolescent/Transition Issues and tagged about us by us, adolescent, Autism Spectrum Disorder, books. Bookmark the permalink.